Dame Cicely Mary Saunders was not only a famous nurse but also a medical social worker, physician and writer. She dedicated her life to the welfare of terminally ill and dying people and laid the foundation for the modern hospice movement. Cicely Saunders was born on June 22, 1918, to a wealthy family in London and was the first of three children. She was sent to boarding schools starting at the age of 10. Always extremely shy, she would later say that her unpopularity gave her greater empathy for others who felt as if they did not belong. She was also troubled by her parents' unhappy marriage that ended in the 1940s. Saunders was turned down by several universities before she was accepted at St. Anne's College in Oxford. When World War II started, she felt so strongly about the war that she left St. Anne's to study at The Nightingale Training School to become a Red Cross war nurse. During her training, she had rotations at several mental hospitals and worked in different areas of Park Prewett Hospital in London. She found the work very stressful but persevered until back problems forced her to leave. Returning to St. Anne's, Saunders studied to be an almoner, a British term for social service worker. Her training was at the Royal Cancer Hospital, and after graduation in 1947, she began working for St. Thomas' Hospital's Northcote Trust, a facility that specialized in cancer treatment. While there, she met and fell in love with someone who would change her life. David Tasma was a cancer patient, and through his experiences, she came to realize that there was a need for better care of the terminally ill. She had a vision that she shared with him, and at his death, he left her 500 pounds and became the inspiration for fulfilling her dream. As preparation for developing the hospice movement, Saunders enrolled in the St. Thomas' Medical School, graduating in 1957 as a physician. Following this, she studied pharmacology to understand better how to alleviate the pain of the terminally ill. She came to advocate the regular administration of pain medication rather than waiting for the patient to ask for it. She found that this method of administration allowed lower doses and the patients remained more alert. This protocol is followed in hospice care today. Once her education was completed, Saunders prepared her plans for a hospice facility. She emphasized not only physical care but also spiritual and emotional care that would provide a comforting, homelike atmosphere. She also was concerned about the welfare of the patients' families. After her hospice concept was developed, Saunders started raising money for construction of the physical facility. Called St. Christopher's Hospice, it was opened in 1967. She was quoted as saying it was a hospital and a home. It is still providing compassionate, palliative care to cancer patients and those with other terminal illnesses. It is the prime example for quality hospice care throughout the world. Ironically, both Saunders and her husband died at St. Christopher's Hospice. Dame Cicely and Marian Bohusz-Szyszko, an artist, were married in 1980. After a long illness, he died at St. Christopher's in 1995. She worked until the very end of her life and died from cancer at St. Christopher's in 2005. 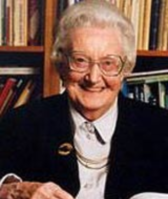 Throughout her career, Cicely Saunders received many recognitions and awards. In 1979, she received the title, Dame Commander of the Order of the British Empire. In 2001, the Conrad N. Hilton Humanitarian Prize of one million dollars was given to St. Christopher's Hospice in Saunders' honor. There are many more awards and honors that can be found in the references. Dame Cicely Saunders was very humble about her accomplishments. She said that her objective was to alleviate pain, but it was not long before she realized that pain was more than physical. She developed and instituted the concept of caring for the whole person and providing comfort and dignity until the end of life. Her example shows what just one dedicated person with a vision can do. Just three years before her death, Sanders co-founded Cicely Saunders International. This charity promotes research to study the care and treatment of all patients with terminal illnesses and strives to make palliative care available to anyone who needs it. Saunders was a prolific writer and lecturer. Two of the most interesting publications are collections of her writings, published in 2005 and 2006.